maharashtrian kadhi recipe - quick yogurt and gram flour based sauce or kadhi without pakoras. tempered with spices and a bit sweet. 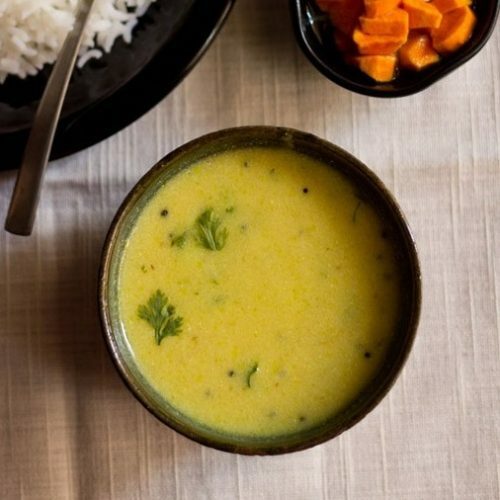 maharashtrian kadhi is best served with some steamed rice and makes for a simple summer meal. mix together curd, water and gram flour in a bowl. using a wired whisk, mix the batter so well so that no lumps are there. heat ghee or oil in a pan. add the mustard and let them crackle. then add the cumin. stir and add the green chilies, ginger and curry leaves. saute for a few seconds. add the turmeric powder and asafoetida. stir and then add the yogurt+water+gram flour mixture. season with salt and sugar. stir very well. let the kadhi come to a gentle simmer. continue to simmer till the kadhi becomes slightly thick. stir at intervals. if you cook more it will become more thick. so depending on the consistency you prefer, you can simmer the maharashtrian kadhi accordingly. check the taste and then add more salt or sugar if required. lastly garnish maharashtrian kadhi with chopped coriander leaves. serve the maharashtrian kadhi hot with steamed rice or mung dal khichdi topped with a bit of ghee along with papad and pickle. use the curd which is made from full fat milk. otherwise the curd can split. you can also add jaggery instead of sugar.